Indoor Air Quality | Polyflor Canada Inc.
Indoor air quality is a key consideration when selecting building products due to the amount of time people within them. Polyflor vinyl flooring makes a significant contribution towards creating indoor environments with very low VOC (volatile organic compounds) emissions. All of our flooring ranges have already passed key international standards but we continuously look to reformulate our ranges to ensure their VOC emissions are kept to the lowest levels achievable. AgBB; Swedish B.P.D (FLEC test); Finland M1 test; GBCA Compliant (GreenTag approval); Afsset A+ and FloorScore®. The most recent test method by Eurofins, is ‘Indoor Air Comfort’. This test method is the most comprehensive and stringent within the industry, worldwide, and tests for all known emissions. All Polyflor products tested to date have achieved Indoor Air Comfort Gold. 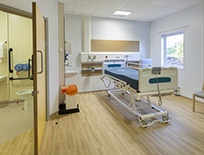 Along with positive VOC test results, there is no evidence to suggest that vinyl flooring contributes to common allergies such as asthma or dust allergies and is favoured for its superior ‘cleanability’ over other flooring products and is used in the strictest of hygiene zones throughout hospitals. Furthermore it is non-shedding, whereby most allergies are caused by airborne dust. Clean room test certification for non-shedding is available on most ranges.